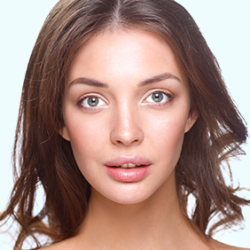 Photorejuvenation offers dramatic improvement to multiple conditions such as, sun damage, spider veins, freckles, age spots, mottled pigmentation, rosacea and other facial imperfections. Intense Pulsed Light delivers a special range of wavelengths of light in customizable pulses through a sapphire tip gently onto the skin. The light is absorbed either superficially by broken capillaries and dark pigment or deeper by larger vessels and collagen. Dilated capillaries coagulate, pigmented lesions darken and then slough off and new collagen fibers are laid down, giving the skin a renewed and more youthful appearance. A cold gel is usually applied to the area to be treated and you may be given dark goggles to block bright light. You may feel a light stinging like the snap of a rubber band as the pulses of light are applied. An anesthetic cream may be applied, but is seldom required. Each treatment typically takes about 20 minutes. Depending on the number of conditions being treated and the severity of each, you may be recommended a series of 4-6 treatments spaced 2-4 weeks apart. In general, excellent long term results can usually be achieved with a series of treatments, although studies have shown significant benefits can be achieved with a single treatment. By dividing the full program into several treatments, the procedure provides gradual improvement with very low risk, preserving the convenience of a “no downtime” procedure. You can return to work the same day and resume regular activities.